The above is Zechariah 14:3 and the “then” it is speaking of is described in the first two verses, which tell of the division and desolation of Jerusalem. As we saw in the previous post, it is at the end of this desolation, when preaching has had its effect on the few who received it (the elect remnant), that the LORD accelerates and amplifies His glory and makes His presence undeniably obvious. Zechariah 14 goes onto describe the same such Advent, which we’ve many times discussed as when those who’ve caused the desolation are consumed by their own words and ways. Friends, this is speaking of the LORD appearing in His Righteous Judgment, revealing those in whom is His light, as His apparent presence, by which He elevates them by showing they are those He has approved to end the argument by right judgment (rightly dividing the word of truth). The word “approved” in 1 Corinthians 11:19 above is the seven times used Greek word dokimos, a word literally meaning what remains after being assayed. It is speaking of the result of a full examination, and the thereby refined thinking. It is the word used in 2 Timothy 2:15, also rendered approved, describing showing one’s self as such by study, and by purging self from “profane and vain babblings” and those teaching them. Paul also urges Timothy to avoid “foolish and unlearned questions” because they are meant to produce and continue endless arguments. These are the ways of the dividers of men, dividers of the body of Christ, who have brought in damnable heresies, even denying the LORD when He appears to end the division. 1 You therefore, my son, be strong in the grace that is in Christ Jesus. 2 And the things that you have heard of me among many witnesses, the same commit you to faithful men, who shall be able to teach others also. 3 You therefore endure hardness, as a good soldier of Jesus Christ. 4 No man that wars entangles himself with the affairs of this life; that he may please him who has chosen him to be a soldier. 6 The husbandman that labors must be first partaker of the fruits. 7 Consider what I say; and the LORD give you understanding in all things. 13 If we believe not, yet he abides faithful: he cannot deny himself. 15 Study to shew yourself approved [dokimos] unto God, a workman that needs not to be ashamed, rightly dividing the word of truth. 18 Who concerning the truth have erred, saying that the resurrection is past [ginomai – come into being] already [they are saying the incorruptible state has been reached, which their own denial of the LORD, and their pride, contradict]; and overthrow the faith of some. 19 Nevertheless the foundation of God stands sure, having this seal, The LORD knows them that are his. And, let every one that names the name of Christ depart from iniquity. 20 But in a great house there are not only vessels of gold and of silver, but also of wood and of earth; and some to honor, and some to dishonor. 21 If a man therefore purge himself from these, he shall be a vessel unto honor, sanctified, and meet for the master’s use, and prepared unto every good work. 26 And that they may recover themselves out of the snare of the devil [which is misleading advice, which causes men to stray away from God], who are taken captive by him at his will. 17 For he received from God the Father honor and glory, when there came such a voice to him from the excellent glory, This is my beloved Son, in whom I am well pleased. 1 But there were false prophets also among the people, even as there shall be false teachers among you, who privily [from their own imaginations] shall bring in damnable heresies, even denying the LORD that bought them, and bring upon themselves swift destruction. 3 And through covetousness shall they with feigned words make merchandise of you: whose judgment now of a long time lingers not, and their damnation slumbers not. This approval process also manifests itself in the approval of men, when we wait for the LORD’s judgment, which is education that removes all errors. This appears as Zechariah 14 tells us, when these men’s tongues consume away, meaning their words, which have set the fire of hell, are seen as worthless and divisive (or vain and profane babblings). 3 But with me it is a very small thing that I should be judged of you, or of man’s judgment: yea, I judge not mine own self. 4 For I know nothing by myself; yet am I not hereby justified: but he that judges me is the LORD. Romans 14 begins by speaking of receiving those who are weak in the faith, and because of their weakness, they are judging one and other. The passage goes on to say that those who are strong in the faith should bear with the weak, who are the unlearned, long-suffering until they are educated into acknowledging the truth (see 2 Timothy 2:25 & 26 above). 10 But why do you judge your brother? or why do you set at naught your brother? for we shall all stand before the judgment seat of Christ. 11 For it is written, As I live, says the LORD, every knee shall bow to me, and every tongue shall confess to God. 13 Let us not therefore judge one another any more: but judge this rather, that no man put a stumbling-block or an occasion to fall in his brother’s way. 14 I know, and am persuaded by the LORD Jesus, that there is nothing unclean of itself: but to him that esteems any thing to be unclean, to him it is unclean. 15 But if your brother be grieved with your meat, now walk you not charitably. Destroy not him with your meat, for whom Christ died. 18 For he that in these things serves Christ is acceptable to God, and approved [dokimos] of men. 19 Let us therefore follow after the things which make for peace, and things wherewith one may edify [educate] another. 7 Do you look on things after the outward appearance? if any man trust to himself that he is Christ’s, let him of himself think this again, that, as he is Christ’s, even so are we Christ’s. 13 But we will not boast of things without our measure, but according to the measure of the rule which God has distributed to us, a measure to reach even unto you. 16 To preach the gospel in the regions beyond you, and not to boast in another man’s line of things made ready to our hand. 17 But he that glories, let him glory in the LORD. 18 For not he that commends himself is approved [dokimos], but whom the LORD commends. These last verses are actually a reiteration of verses above, which speak of Christ in us as He who has prepared what will show us as approved. The word rendered “commends” is the word suniemi, meaning to be set together, here as joined with the LORD. In the prior post, we saw the last verse of Haggai saying this of Zerubbabel, the LORD saying He would put His signature upon him, to show He has chosen Him. We also saw this comes as the seal of the LORD shaking the wicked from the earth (Job 38:13 & 14), which we also saw from Hebrews 12 comes by His spoken word. The pattern of Zerubbabel, the one who is born by coming out of confusion, who represents the LORD’s Righteous Judgment returned to civil government, is also represented in the one Isaiah calls Cyrus. Cyrus is described in Isaiah 45, which Paul also quotes in Romans 14:11 above. The name Cyrus is from Hebrew words telling of being measured in the furnace – or tried in the fires, as in dokimos, what remains after assayal. 1 Behold, I will send my messenger, and he shall prepare the way before me: and the LORD, whom you seek, shall suddenly come to his temple, even the messenger of the covenant, whom you delight in: behold, he shall come, says the LORD of hosts. 3 And I will give you the treasures of darkness, and hidden riches of secret places, that you may know that I, the LORD, which call you by your name, am the God of Israel. 4 For Jacob my servant’s sake, and Israel mine elect, I have even called you by your name: I have surnamed you, though you have not known me. 8 Drop down, you heavens, from above, and let the skies pour down righteousness: let the earth open, and let them bring forth salvation, and let righteousness spring up together; I the LORD have created it. 9 Woe unto him that strives with his Maker! Let the potsherd strive with the potsherds of the earth. Shall the clay say to him that fashioned it, What make you? or your work, He has no hands? 10 Woe unto him that says unto his father, What beget you? or to the woman, What have you brought forth? 11 Thus says the LORD, the Holy One of Israel, and his Maker, Ask me of things to come concerning my sons, and concerning the work of my hands command you me. 13 I have raised him up in righteousness, and I will direct all his ways: he shall build my city, and he shall let go my captives, not for price nor reward, says the LORD of hosts. 14 Thus says the LORD, The labor of Egypt, and merchandise of Ethiopia and of the Sabeans, men of stature, shall come over unto you, and they shall be yours: they shall come after you; in chains they shall come over, and they shall fall down unto you, they shall make supplication unto you, saying, Surely God is in you; and there is none else, there is no God. 15 Truly you are a God that hides yourself, O God of Israel, the Savior. 17 But Israel shall be saved in the LORD with an everlasting salvation: you shall not be ashamed nor confounded world without end. 18 For thus says the LORD that created the heavens; God himself that formed the earth and made it; he has established it, he created it not in vain, he formed it to be inhabited: I am the LORD; and there is none else. 19 I have not spoken in secret, in a dark place of the earth: I said not unto the seed of Jacob, Seek you me in vain: I the LORD speak righteousness, I declare things that are right. 20 Assemble yourselves and come; draw near together, you that are escaped of the nations: they have no knowledge that set up the wood of their graven image, and pray unto a god that cannot save. 21 Tell you, and bring them near; yea, let them take counsel together: who has declared this from ancient time? who has told it from that time? have not I the LORD? and there is no God else beside me; a just God and a Savior; there is none beside me. 22 Look unto me, and be you saved, all the ends of the earth: for I am God, and there is none else. 1 Behold, the day of the LORD comes, and your spoil shall be divided in the midst of you. 5 And you shall flee to the valley of the mountains; for the valley of the mountains shall reach unto Azal: yea, you shall flee, like as you fled from before the earthquake in the days of Uzziah king of Judah: and the LORD my God shall come, and all the saints with you. 8 And it shall be in that day, that living waters shall go out from Jerusalem; half of them toward the former sea, and half of them toward the hinder sea: in summer and in winter shall it be. 9 And the LORD shall be king over all the earth: in that day shall there be one LORD, and his name one. 10 All the land shall be turned as a plain from Geba to Rimmon south of Jerusalem: and it shall be lifted up, and inhabited in her place, from Benjamin’s gate unto the place of the first gate, unto the corner gate, and from the tower of Hananeel unto the king’s winepresses. 11 And men shall dwell in it, and there shall be no more utter destruction; but Jerusalem shall be safely inhabited. 12 And this shall be the plague wherewith the LORD will smite all the people that have fought against Jerusalem; Their flesh shall consume away while they stand upon their feet, and their eyes shall consume away in their holes, and their tongue shall consume away in their mouth. 13 And it shall come to pass in that day, that a great tumult from the LORD shall be among them; and they shall lay hold every one on the hand of his neighbour, and his hand shall rise up against the hand of his neighbour. 14 And Judah also shall fight at Jerusalem; and the wealth of all the heathen round about shall be gathered together, gold, and silver, and apparel, in great abundance. 15 And so shall be the plague of the horse, of the mule, of the camel, and of the donkey, and of all the beasts that shall be in these tents, as this plague. 16 And it shall come to pass, that every one that is left of all the nations which came against Jerusalem shall even go up from year to year to worship the King, the LORD of hosts, and to keep the feast of tabernacles. 17 And it shall be, that whoso will not come up of all the families of the earth unto Jerusalem to worship the King, the LORD of hosts, even upon them shall be no rain. 18 And if the family of Egypt go not up, and come not, that have no rain; there shall be the plague, wherewith the LORD will smite the heathen that come not up to keep the feast of tabernacles. 19 This shall be the punishment of Egypt, and the punishment of all nations that come not up to keep the feast of tabernacles. 20 In that day shall there be upon the bells of the horses, Holiness Unto The LORD; and the pots in the LORD’s house shall be like the bowls before the altar. 21 Yea, every pot in Jerusalem and in Judah shall be holiness unto the LORD of hosts: and all they that sacrifice shall come and take of them, and seethe therein: and in that day there shall be no more the Canaanite in the house of the LORD of hosts. 1 Keep not you silence, O God: hold not your peace, and be not still, O God. 2 For, lo, your enemies make a tumult: and they that hate you have lifted up the head. 3 They have taken crafty counsel against your people, and consulted against your hidden ones. 8 Assur also is joined with them: they have helped the children of Lot. Selah. 13 O my God, make them like a wheel [as in these times past]; as the stubble before the wind. 15 So persecute them with your tempest, and make them afraid with your storm. 16 Fill their faces with shame; that they may seek your name, O LORD. 18 That men may know that you, whose name alone is Jehovah, are the most high over all the earth. 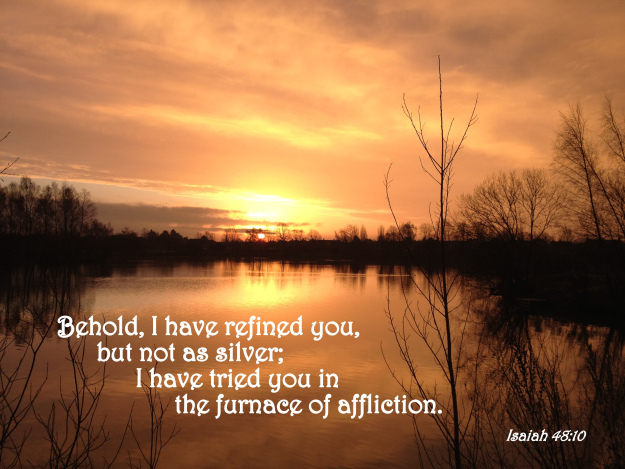 Next PostNext (To God’s Elect Remnant) Behold, I have refined you, but not with silver; I have chosen you in the furnace of affliction.